Sandwiched between the ferry terminal and Port Swettenham pier on Weld Quay, along with a sweeping seaview, Hai Nan Town Nyonya restaurant attracts quite a number of tourists. 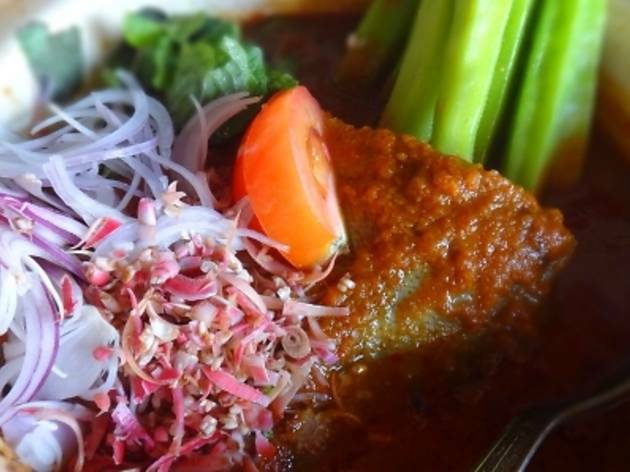 Their menu of around 16 savoury dishes may seem small compared to other Nyonya restaurants around town but it represents the Peranakan Nyonya flavours sufficiently. 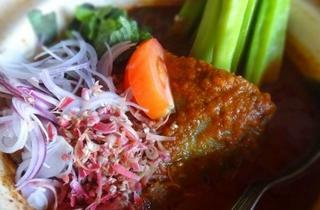 You can expect the usual Nyonya favourites of perut ikan of mixed vegetables curry, curry tumis fish, assam prawns, yam duck, joo hoo char, beef rendang and mutton stew. Also spring rolls and lorbak as munchy starters. While most main dishes come in three sizes from RM14+, the seafood dishes such as fish and prawns are according to market price. We chose curry tumis black pomfret fish at RM38+ that appeared in a claypot dressed with steamed lady’s fingers and finely chopped herbs atop the tangy, spicy curry and fresh, firm pomfret cut into three pieces. To pair that and steamed rice, we had deep-fried inchi kabin (chicken) at RM14+ and chilli fried four-angled beans with prawns at RM10+. Crunchy and delicately spicy, the sliced four-angled beans not only added texture to each spoonful but they had a distinct, subtle pungent flavour too. The fried inchi kabin of four pieces of chicken marinated in spices were a little dry and not the best we’ve had in terms of taste and texture. However, they certainly will satisfy children and those who aren’t prone to spicy food.